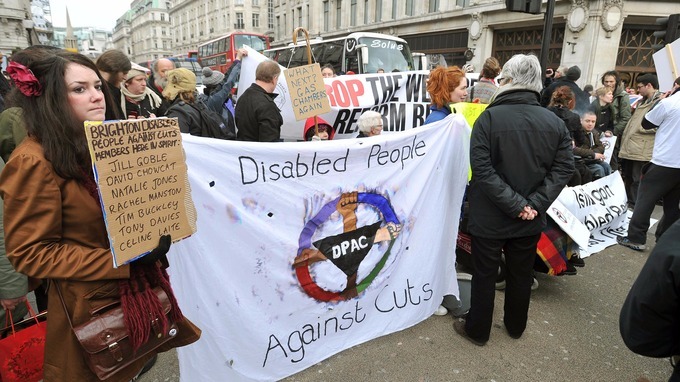 There is an increased awareness of racism, sexism and homophobia within the trade union movement, political parties and society; but the issues surrounding disablism are rarely entertained.Disabled people are part of the resistance movement, but we deserve to be respected, acknowledged and better supported. At times it feels as if our oppressors and allies have more in common than we and they would like. Only through inclusive practice and engagement with disabled people’s experience of disablism will ‘unity is strength’ really mean something. Disabled people wish to end situations where we feel by-passed or forgotten. So why is Access a Political Issue? The materialist based social model sees disability as the creation of social restrictions which result from and contribute to the oppression of people with impairments via systems and structures which serve in the interest of capitalism. The nature of this treatment – often discriminatory – is experienced in a myriad of ways. People with physical impairments and mental health service users, for example, can encounter very different disabling barriers due to how, historically, society has determined the social relations of the membership of these groups. This includes the use of pejorative labels. At a micro level of society, disabling barriers can be viewed as the failure to introduce inclusive practice but this fails to tell the whole story. It is necessary to recognise that at a macro level disablism exists within structures of society and takes on the character of institutional discrimination – e.g. the labour market, legal system, government policy, etc. (iii) they identify themselves as a disabled person. This primarily works for developing policies, procedures and practice however on a day-to-day engagement level it may be necessary to invite disabled people to identify specific needs they may have. Branch organisers need to invite people to identity their support needs in a confidential manner if required in order to ensure they are catered for. Key to understanding disability politics is the ability to develop awareness and strategies to identify and address social environments which exclude or marginalise disabled people. Holding a meeting on the second floor of pub is creating an inaccessible environment – a form of apartheid – and this impacts on various social groups not just disabled people. Social justice and addressing the equalisation of opportunity cannot be achieved by taking a ‘one size fits all’ approach; consideration of the diversity of needs is required. Access is a major issue for a variety of groups of disabled people; those with visual impairments encounter different disabling barriers to those who are learning disabled or have limited mobility. Only by addressing these issues can we develop an inclusive practice. Disabled people’s oppression stems from how society and people fail to take their needs and issues into account. Ignorance is a political weapon against disabled people. How can disabled people find out about our activities? Is our material accessible? Do our activities prevent or discourage disabled people’s participation? What are the social environments we work within like for disabled people – level access, easy access toilets, transport systems available, parking, noise levels, clearly signed? Do you know how to contact local Disabled People’s Organisations for support and advice? An inclusive product, service or environment does not exclude any section of society. Inclusive solutions consider all users, including disabled people, and is a positive step towards a holistic, universal system. Acknowledge individuals have unique and particular needs in learning, social and work environments. Respect each individual’s right to express and present themselves relative to their religion, culture, ethnic background, sexual orientation, gender-identity, identity as disabled people. Promote inclusivity by reasonably adjusting procedures, activities and physical environments. Focus on the learning or support needs of the individual without assumptions or labels. Be inclusive in all forms of communication. Serve all with sensitivity, respect, and within boundaries of social justice. The conduct of the meeting. All this and more can be found in our guide. Remember, if you can’t afford meeting people’s rights then you can’t afford to hold that meeting or event.